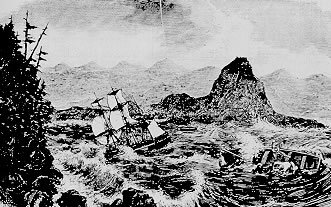 Leaving Astoria, the Tonquin sailed to Clayoquot to trade for furs, where the insolence of Captain Thorn so outraged the Indians that they seized the ship and massacred all but three or four of the crew. These survivors, before escaping in the ship’s boat, lit a fuse leading to the Tonquin’s powder magazine. Some 200 Indians were killed when the ship blew up.